Get Catapult ready for public launch. Make Catapult easy to use and accessible. Drive adoption through our global service partner network (NEMsp). 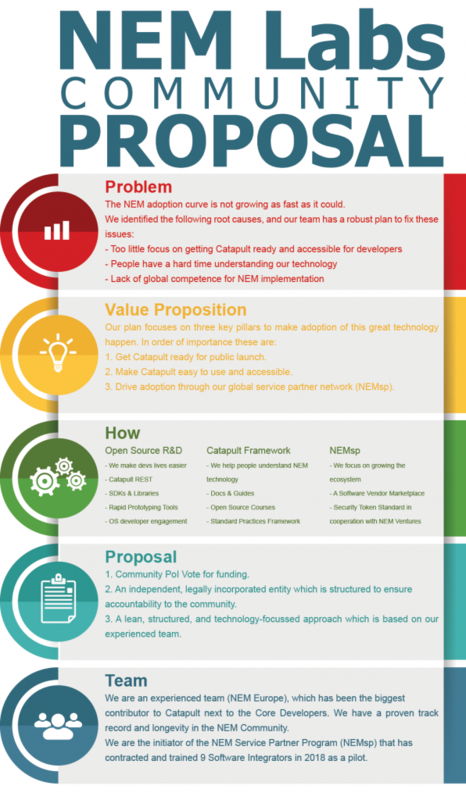 Out of respect to the NEM Community, we have put together a very transparent and detailed Business Plan to ensure you are able to make an informed decision with your PoI vote „click here 121“. Enclosed within the Business Plan is also a very detailed and transparent budget breakdown. We will announce further details about the PoI vote in the coming days. We look forward to your comments in the forum!